Home > Environment, Health, Safety First	> Air Quality in Cars: Ventilate your Car – Roll down the Windows! Most people know that second-hand smoke is dangerous to those around them. There have been many campaigns against smoking in a car with other passengers especially in front of children. Fortunately, the frequency of second-hand smoke exposure in cars has been declining year after year . But have you ever considered air pollution in cars? Did you know that toxic chemicals are leaching from all of the soft/hard plastics, fire-retardant materials, vinyl/leather seats with industrial-made foam, chemically treated cloths, etc? And did you know that there are other toxic chemicals leaking from other items ranging from baby car seats to even air fresheners. Giving the benefit of the doubt to car manufacturers, the materials used in cars may be rated “safe” when initial tests are conducted in “indoor” labs under normal conditions. However, those same materials may exhibit different characteristics when exposed to severe elements such as prolonged exposure to UV light from the sun with extremely high temperatures. In fact, the level of volatile organic compounds is increased by 40% during the summer . The concentration of toxic chemicals in the car will depend on the inside temperature and length of exposure to the sun. What are some of the chemicals known to be found in the air inside a car/suv? Some of them include volatile organic compounds, poly-brominated diphenylesters, aliphatic hydrocarbons, aromatic hydrocarbons and polychlorinated biphenyl, amongst many others . Unfortunately there are very few scientific studies or even articles measuring the air quality of cars especially in situations where the car is left out in the sun in high temperatures. To the average adult, the concentrations of toxins that may be present in the air may cause minimal damage. However, babies and children are more vulnerable to these toxic environments than adults are. Babies have immature organ systems that cannot cope with toxic chemicals that are entering the body. The surface area of a newborn baby’s skin is roughly three times greater by volume versus the adult. In other words, babies can absorb more through their skin versus the adult in the same situation. Also, the respiratory rate of a newborn baby and toddlers is higher than adults. This means the baby will breathe and absorb more air contaminants than an adult . The ramifications of these physiological facts are very much understated in children. In reality, it is solely up to the parents to protect their children from dangerous situations – e.g. by finding BPA free items. Is there anything I can do? The only way you can help protect yourself and your children from these cancer causing chemicals is by ventilating your car. Before you drive away in your car (and especially before you place your newborn baby in your car), roll down the windows and turn on the a/c on high with the vents open to the outside. There are some cars that allows the driver remotely to roll down all of the windows with the press of a button before you enter. There are even some cars that have remote start that turns on the a/c before you set foot into the car (make sure that the a/c vents are open to the outside). Other cars have solar panels which turn on a fan to the outside to expel the heat in the car. One can also crack open the windows while running short errands to the store. Of course, some situations just make it is difficult to ventilate the car before driving away, but providing ventilation when possible is the best way. Whatever you do, make sure that you roll down the windows with the car fan/air conditioner turned on when you drive away for the first couple of minutes to fully ventilate the air inside the car. Other suggestions are to limit sun exposure and heat by parking in the shade or in the garage. There are other benefits that will result from turning on the air conditioner – most cars nowadays contain cabin air filters which will improve air quality and dramatically reduce the number of microorganisms and mold spores in the car. Overall, it is good practice to always ventilate your car during the first few minutes of vehicular operation especially when the car is out in sun in extreme heat. 1. King BA, Dube SR, Tynan MA. Pediatrics. 2012 Mar;129(3):446-52. doi: 10.1542/peds.2011-2307. Secondhand smoke exposure in cars among middle and high school students–United States, 2000-2009. 2. Geiss O et. al. Environ Int. 2009, 35:1188-1195. Investigation of volatile organic compounds and phthalates present in the cabin air of used private cars. 3. D. Muller, et. al. Journal of Occupational Medicine and Toxicology. 2011, 6:33. 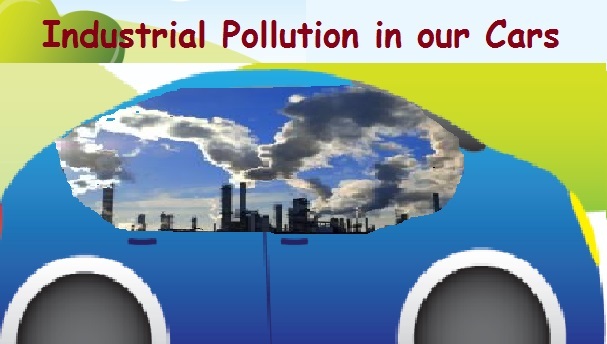 Car indoor air pollution – analysis of potential sources. 6. Hazrati S, Harrad S. Environ Sci Technol. 2006 Dec 15;40(24):7584-9. Causes of variability in concentrations of polychlorinated biphenyls and polybrominated diphenyl ethers in indoor air. 8. Yoshida T, Matsunaga I. Environ Int. 2006 Jan;32(1):58-79. Epub 2005 Jul 1. A case study on identification of airborne organic compounds and time courses of their concentrations in the cabin of a new car for private use. Hi, Joon, great to see that you brought up our attention on this issue. But i am sorry to say that, ventilation is not going to help the root problems. I have been doing this research for a while and there is a great way to get rid of those air pollutants. If any body wants to know more, please just reply me. As a mom, i want to do best to protect our babies and children’s health. Please elaborate more. I’m interested! It is called photocatalyst. It is a nano technology. There are some different options. The one i go with is a water kind coating that spread in the car. This coating will help to deoxidize those PM and other VOCs etc. The most great thing about this coating is, it only needs sun light to active it. And it turns those harmful pollutants into water and carbon dioxide. You might want to check out our company’s website: http://www.nano-antimicrobial.com. And do more research about photocatalyst.